Today, the French Open draw was revealed. Because Serena and Venus Williams are the top two seeds, the possibility of an all Williams final exists. However, with Justine Henin, a four time champion, a potential quarterfinal rival for Serena and Venus perhaps seeing Aravane Rezai or Nadia Petrova in the round of 16, the list of spoilers is extensive. Here’s a snapshot of the likely key match-ups which may eventually determine the victor. After months of being a spectator, Serena rejoined the tour in Rome where she reached the semifinals. Despite an early exit in singles in Madrid, Serena got reacquainted with the surface by prevailing in doubles along with Venus. Serena’s first obstacle would come in the form of Marion Bartoli in the round of 16 since she would play a denizen. Still, Serena’s biggest hindrance lies in the quarters. 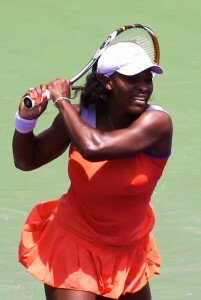 Serena lost to Henin, the eventual champion, in 2003 and 2007. On the other hand, that match may not materialize as Henin could battle Maria Sharapova in the third round. Samantha Stosur, a semifinalist in 2009 and the titlist in Charleston this year, is another potential tough quarterfinal opponent for Serena. Following Serena, Jelena Jankovic is the next highest seed in the top half of the draw. With players such as Dinara Safina, Yanina Wickmayer and Vera Zvonareva returning from injury on Jankovic’s side of the draw, she should have an uneven full path to the quarters. Agnieszka Radwanska or Ana Ivanovic could be Jankovic’s quarterfinal adversary. Since her glorious days at Roland Garros in 2008, Ivanovic has slipped. For the first time in months, Ivanovic showed true signs of life with a semifinal posting in Rome. Perhaps it will take Paris to completely get Ivanovic out of her slump. Venus Williams and defending champion Svetlana Kuznetsova flank the bottom half of the draw. So far this year, Kuznetsova’s results have been mediocre. Consequently, for Kuznetsova, it is safe to deduce that a replay of 2009 is a long shot. In the first round, Kuznetsova faces a difficult opponent, Sorana Cirstea. Should she move on, Maria Kirilenko could upset her in the third round. Li Na and Francesca Schiavone could trouble Kuznetsova in the round of 16. Moreover, legitimate stumbling blocks in the quarters for Kuznetsova include Flavia Pennetta, Lucie Safarova, Alexandra Dulgheru and Caroline Wozniacki. On the other hand, Wozniacki, the third seed, has been hampered by an ankle injury since Charleston. For that reason, Wozniacki has failed to make an impact after winning in Ponte Vedra Beach. In the third round, Wozniacki may see Dulgheru and Pennetta or Safarova in the fourth round. Considering the caliber of those rivals, it’s doubtful that Wozniacki has lasting power. For the second consecutive week, an unseeded player rules at a premier clay event. In the finals of the Mutua Madrilena Madrid Open, Frenchwoman Aravane Rezai stunned world number three Venus Williams. Rezai prevailed 6-2, 7-5 over Williams to capture the grandest title of her blooming career. After breezing through her initial game, at 1 all, Venus made an error on game point leading to deuce. Later, by sending a forehand out of play, Venus gave Rezai a second break point. When Williams netted a backhand, Rezai took a 2-1 lead. Subsequent to a double fault, Rezai provoked four straight miscues from Williams and consolidated for 3-1. Then, with Venus serving at 2-4, she produced her second double fault of the game to hand Aravane double break point. With a crosscourt forehand return winner, Rezai extended her lead to 5-2. Thereafter, with a love game, Rezai grabbed the first set. The previous set, Rezai won 100% of her first serve points. If Williams intended to turn this match around, she would need the Frenchwoman to cool off. After Venus held, in a game that included a double fault, Rezai had a backhand go long permitting Williams her initial break chance of the match. With an ace, the Frenchwoman erased that deficit. By converting a forehand crosscourt winner, Williams had a fourth break point opportunity. Venus cashed in when Aravane’s backhand crosscourt misfired. However, the next game, a lack of first serves allowed Rezai to break back. Subsequently, a backhand up the winner handed Venus another break point. Williams took a 3-1 edge when Rezai’s forehand traveled long. Despite dealing with a break point, Williams consolidated for 4-1. Soon, Venus had two chances to get a double break lead, yet, Rezai hung tough to keep the margin to one break. Serving at 2-5, with an error, Rezai gifted Williams her first set point. Once more, the Frenchwoman goaded the miscues from her opponent to remain in the set. With a string of mistakes by Venus, Aravane manufactured two break points and by connecting on a forehand down the line winner got back on serve at 4-5. Following, Rezai wiped out five additional set points by Williams to level things at 5 all. That ultimate game proved a back breaker for Williams. After a backhand pass winner by Rezai, Williams made two backhand errors to face 0-40. With another backhand miscue by Venus, Rezai secured a 6-5 advantage. As the backhand continued to leak, Rezai obtained double championship point. Finally, by provoking a forehand mistake by Williams, Rezai pocketed the trophy. In the second round at the Sony Ericsson Open, Svetlana Kuznetsova was pushed to three sets by China’s Shuai Peng. But, Kuznetsova, the top seed, averted an upset with a 6-2,3-6,6-4 win. After dominating in the opening set, Kuznetsova was broken early in the second. Despite numerous chances to get back on serve, Kuznetsova’s failed to capitalize because of an inconsistent forehand. In the decisive third set, Kuznetsova obtained the early edge for a 3-1 lead. However, with a strong forehand stroke causing the error by Kuznetsova then a superb return, Peng erased the break deficit. Later on in the set, Kuznetsova captured the crucial break allowing her to seal the victory. Q. Seems like your forehand has been off lately. What’s going on there? Kuznetsova: Actually, it’s good. But just getting a little bit–I’m frustrated because I’m not making, but I feel it good. Q. Do you fell more pressure after winning the French. Are you putting more pressure on yourself? Kuznetsova: I don’t put pressure. I just get disappointed when I’m not playing good enough. That’s it. Peng’s compatriot, Li Na, 2010 Australian semifinalist and 8th seed, was equally unlucky as Switzerland’s Timea Bacsinszky after multiple opportunities to win in straight sets, prevailed in a third set tiebreaker 6-4,4-6,7-6. In other matches, Marion Bartoli, the 11th seed, had no problem with Magdalena Rybarikova 6-2,6-4 . After losing the first set, Sabine Lisicki retired due to injury against Yaroslava Shvedova. Andrea Petkovic bested 10th seed Flavia Pennetta 6-3,3-6,6-0 . Although her serve is still problematic, Ana Ivanovic came through in her match against Pauline Parmentier 6-4,6-3. After a tricky initial set, 6th seed Agnieszka Radwanska cruised in the second set for a 7-5,6-0 victory over Ekaterina Makarova. Surprisingly, Agnes Szavay squashed Alicia Molik 6-0, 6-0. Once more this year, Gisela Dulko ousted a seeded player, this time she victimized Alona Bondarenko 7-5,6-2. Up and coming Frenchwoman Aravane Rezai had her tournament cut short as the 18th seed went down to 19 year old wildcard Petra Martic. 30th seed Anabel Medina Garrigues and 31st seed Aleksandra Wozniak fell to Roberta Vinci and Polona Hercog respectively. Yanina Wickmayer, Nadia Petrova, Daniela Hantuchova, and Roberta Vinci are through to the third round. In the night session, meeting for the first time, Venus Williams battled Sorana Cirstea. Down love-40, Venus double faulted at 2 all to give Cirstea the break. Serving at 4-3, Cirstea netted a backhand hand digging herself a triple break point hole. Venus converted when Cirstea committed another backhand mistake. Then, Williams broke a second time at love to carry the first set. Again in the second set, Cirstea drew first blood. With a blazing return, Cirstea set up triple break point and capitalized by forcing Venus to push her forehand long. However, the next game, Venus leveled the set at 2 a piece. Later, after erasing break point, Williams obtained a third break point with a backhand miscue by Cirstea. Venus secured the break for 5-3 when Sorana dumped a forehand into the net. With an easy hold, Venus closed out the match 6-4, 6-3. 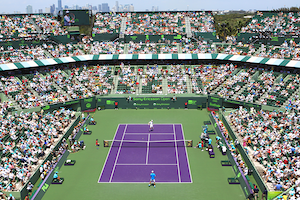 Yesterday, the ATP first round matches were also completed with lucky loser Nicolas Lapentti reaching the second round joined by Juan Ignacio Chela, Dudi Sela, Thiemo De Bakker, Michael Berrer, Philipp Petzschner and Kevin Anderson. Mardy Fish was the only male American to advance yesterday as Ryan Sweeting, Rajeev Ram were both eliminated. Last year, defending champion Elena Dementieva defeated Serena Williams in the semifinals at the Medibank International Sydney. This time around the two battled each other in the finals. Once again, Dementieva beat the world number one 6-3,6-2 to capture the trophy. As a result of a wayward dropshot from Serena, Dementieva had double break point. When Williams’ forehand traveled wide, Dementieva took a 2-1 lead. Although Serena broke right back, later, because of a multitude of errors she lost control of a 40-15 game permitting Elena go back in front 4-3. After Dementieva had no trouble consolidating, she forced Serena into two backhand errors for double set point. Elena converted with a backhand down the line winner. In the opening game of the second set, after shaking off a couple of double faults to hold serve, Dementieva pressured Serena with defense. After Elena erased a few game points by Serena, she manufactured a string of break points. Dementieva cashed in when Williams netted a backhand shot. Subsequent to Dementieva sprinting to a 3-0 advantage, Williams, somewhat hampered by a left knee problem, rubbed away a break point to finally get on the board. 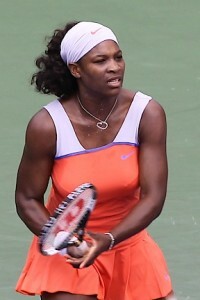 However, Serena’s play continued to deteriorate. Serving to stay in the match at 2-5, Serena made three straight unforced errors gifting Dementieva triple championship point. The next point, Elena obliged by hitting a backhand crosscourt return winner. Williams did not look in optimum form this week. In the semifinals, Serena was four points from being ousted by Aravane Rezai. On the other hand, for the second season in a row, Dementieva has roared out of the gates. In the quarters, Dementieva leveled Dinara Safina and duplicated that result in the semis against Victoria Azarenka. Following such a great tournament, in Dementieva’s case, the usual conundrum is whether she can replicate her performance in Melbourne to ultimately grasp that elusive major.